Serena Williams proved why she is the most dominant female player of her time. She beat number 2 ranked Victoria Azarenka 7-5, 6-7 (6), 6-1, defending her U.S. Open Championship. The match lasted 2 hours and 45 minutes; making it the longest women’s final is U.S. Open history. This is Serena’s second Grand Slam this year, and her 17th overall. Serena is now 7 Grand Slam wins away from Margaret Court’s all time record of 24. On the men’s side, it is none other than Novak Djokovic verses Rafael Nadal for the U.S. Open title. The end to the Grand Slam tennis season is a treat for all tennis fans, as this will be the 6th time Djokovic and Nadal face each other in a major finals. All previous times, they have gone at least 4 sets, and Djokovic is 3-2 in their previous 5 final matches, including the 2011 U.S. Open. 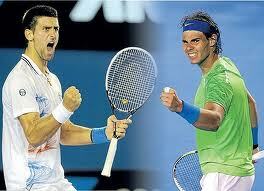 Nadal is an astonishing 21-0 on hard courts this year, and is 21-15 all time against Djokovic. The match is scheduled for 5 pm EST. During this years’ U.S. Open, Nadal’s serve has only been broken once, which should set up an epic battle to the end of the 2013 season. Djokovic’s number 1 ranking will most likely be at stake. These two also met in the 2012 Australian Open, when Djokovic was able to take the Final in 5 sets. Nadal beat Djokovic in the 2012 French Open (Nadal is widely regarded as the best ‘clay’ player of all time), and will be looking for his 13th Grand Slam of his career, and 2nd this year. WHO IS “COURTING” SERENA WILLIAMS NOW?